1 – Oh No I’m Getting My Period! by Princess Superstar ft. Lunette Menstrual Cup. The finnish menstrual cup brand strikes again with a fun video ad for the menstrual cup Lunette. I can’t stop laughing at her lady gaga hip hop style going on about her VajayJayjay. The part in the pool and her face expressions is just too funny. Brilliant rap battle with catchy lyrics and great performers. “Mooncup’s here to stay, no strings attached”. This video went viral in 2013 and I can still watch it over and over. This last one but not the least is in French with english subtitles. 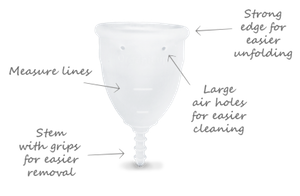 It’s by far the best and most creative menstrual cup review ever done.